I realize this blog may be viewed by many as an over-kill, jumping on the bandwagon, writing about the obvious or another Trump critic. If that is your opinion, you’re probably right. I would prefer to write about Trump policy, his executive orders signed, appointees he would like to have confirmed. Unfortunately, he doesn’t give me, nor others, the opportunity to challenge him in these areas. Sadly, we’re left with such low hanging fruits like, “is he fit for the office”, “what about his character”, ” his staff doesn’t think he’s mentally stable” and the list goes on and on. On a high note, I refuse to bore you with what you hear daily on television about how arrogant he is, self-center, stupid, erratic, foolish, too impulsive, lazy, watch too much television, plays too much golf, too cozy to Putin, doesn’t read, easily angered, lies often and so on…I refuse to talk about those things. However, I cannot ignore how little respect Trump has shown to the women who asked to be heard. Twelve women accused Trump of sexually Harassment, yet they cannot get their voices heard…so many women fall into the “Me Too” syndrome. Michael Wolff’s book, “FIRE AND FURY” has captured America attention like no other book has. Four days and counting, this book is being talked about 24/7 in some form or another. Before I continue, allow me to address how Trump beat sixteen Republicans. Trump simply out racist them. Remember Trump proudly and boldly carried out a one year campaign against President Obama birth and schooling. No other Republican was brave enough to go that far. Meanwhile, thirty percent of White Americans seemingly was waiting for someone to be racist enough to say what Trump was saying. Black Americans and people of color always knew the race card still exist and played a major part in America. The false sense of Trump greatness to beat sixteen qualify Republicans was no phenomenal, on the contrary, it was race bating at the lowest level. divide and conquer. Trump is under investigation for many things and I’m not convinced that he won the election fairly. Therefore, I’m not ready to say he beat Hillary…let’s wait until the investigation is over and all the facts are in. In the past, I’ve written a blog called, “ACTION OF A FRIGHTEN PRESIDENT” which describes some of the behavior we’ve all have witnessed by Trump at one time or another. Perhaps while reading this blog its very possible Trump could demonstrate just how erratic he can be. Trump is such an easy person to poke. All news outlet except Fox finds his character deplorable and unfit to serve as Commander In Chief. Even sadder than Fox is his enablers; The Republican Party at large, Congressmen/women and Senators who continues to cover Trump’s ignorance of government. But the saddest commentary of them all is when others tell him what he wants to hear rather than what he needs to hear. His surrogates know Trump is in constant need of praise and admiration (which they do, simply to get what they want). Meanwhile, the world and the rest of us are very concerned he may possibly start a nuclear war. Shameful, these very same people go on television, radio and other outlets in the disguise of defending him. Trump’s number one enabler is Deputy Press Secretary (Sarah Huckabee), who on a daily base tries to put lipstick on this pig. Secondly, is his campaign manager Kellyanne Conway (now his counselor) who often tries “Alternative Facts” to cover his lack of knowledge. But, It doesn’t matter who the surrogates are, what matter most is what they are not doing and what they are not telling him… the truth. We must consider all the facts, all the descriptions, all of the actions we’ve witnessed by Trump and asked ourselves as well as each other, is he capable? Are you comfortable knowing it’s his hand on the switch? The thought should be frightening reviewing his past while bracing ourselves for what he might do or say next is very frightening, in fact, it’s a NIGHTMARE. Can America take four years of living a daily nightmare? Should America take living a Trump’s nightmare daily? “FIRE AND FURY” plus being frightened should give us all reason to be concerned. Shame on the Republican party for not standing up and speaking louder. In fact too few are not speaking at all. Once upon a time, this party boasted about Country and Patriotism, today they’re so busy pretending to be covering for Trump, in reality, they’re just trying to stay in power…many believe they’ve lost their way. One renown question remains daily, Is Trump mentally fit to serve as President? My fellow Americans once again, the power is in our hand to fix, change and correct the errors the Republicans refuses to do. We must Vote out and Vote in…in this year election. Please ask yourself, is it fair that thirty percent of Americans control seventy percent of us. Now is the time, more than ever before to make your voice heard. If the seventy percent vote in the upcoming elections perhaps we will no longer wake up daily living in a NIGHTMARE. 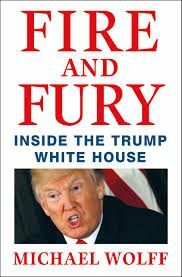 If for some reasons you need a reminder of Trump’s character (or lack thereof) please check out Michael’s Wolff book, “FIRE AND FURY” and the links below.